One of the things I always tell people who want to learn to ride bikes in the woods is that the most important rule to follow is always this. It’s not that hard to do, and the biggest problem with our brains is that wherever we look is where we tend to end up. If you look at the spaces between the trees then that’s where you’ll go, if you look at a tree, that is exactly where you will go. This is all well and good most of the time, but when things start to fall apart or you’ve lost control and you’re flying through the air, that’s when you can sometimes forget this cardinal rule. I was riding in 6″ of snow with an icy hard surface on it on my Phat Phuk and was doing a reasonably steep decent. There were pre-existing trails going on both sides of a 2″ sapling and I looked directly at the tree and floundered for less than a second with indecision before I struck the tree and went flying over the handlebars and off the bike. The display bracket broke (my second display bracket that week actually) and the aluminum front fork bent back so far that the tire was nearly rubbing on the downtube and the bike was essentially unusable as the brake was rubbing against the rotor so hard the front wheel wouldn’t turn. This article explains why aluminum forks are always a bad idea and how I loosened the headset and reversed the fork around so I could ride several miles back to my house. It seems like 90% of the bikes I have use a Chromoly (CrMo) fork which is an alloy of metals, but it is primarily made of steel. If your bike fork is listed as aluminum, alloy or 6061 then it is made out of much softer aluminum. Aluminum forks tend to be much thicker in diameter to make them stronger and have welds that are much bigger as well. If you’re unsure then just get a magnet out and touch it to the fork, if it sticks it’s steel, if not then it’s aluminum or carbon fiber. If you have a carbon front fork you probably know it, because these tend to be much more expensive than steel or aluminum. I’m not a big fan of carbon front forks (or carbon anything really). I don’t believe that carbon fiber has a place on single track trail bikes as it tends to fail catastrophically without any warning. The safest fork to have is steel, the best ‘feeling’ fork to have on the trail (other than a suspension fork) is also steel. Steel feels springy while aluminum forks are much more jarring with every bump. Although I have a carbon fork on my road bike build (I don’t like it) I’ve never ridden carbon frames or forks on the trail so I can’t speak to their reliability, some people seem to love them. The ironic thing is that the cheaper bikes tend to have steel forks while the more expensive fat bikes can sometimes have aluminum forks. 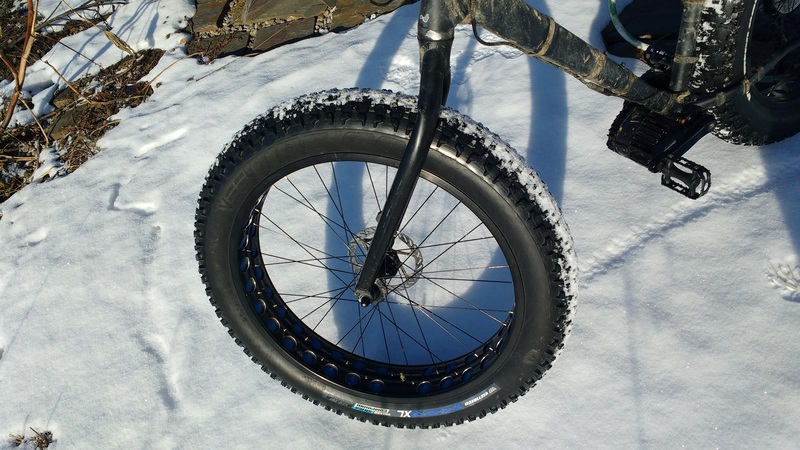 High-end fat bikes almost always have carbon forks which tend to shave a pound or two off using a steel or aluminum fork. 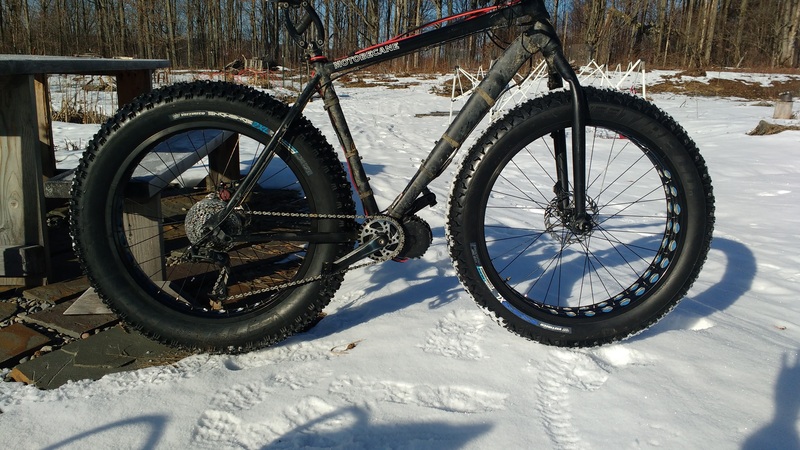 Since the fat tires absorb a lot of the violent jarring of the trail, carbon forks are wildly popular amongst the wealthier fat biking crowd (of which I am clearly not a part of). I’m going to go out on a limb here and just say that for high-speed or trail ebikes, steel is the right choice for non-suspension front forks. If you don’t agree, that’s cool, just start your own blog and then spend hundreds of hours writing articles so people don’t think you are a complete poser like I am. The reality is that if you’re going to be hitting trees with your bike, there is a good chance that you’re going to bend any fork you have. While steel is the toughest, the physics of your front fork are such that you’re looking at a giant lever about 3 feet long. Put enough force on the end of the lever and something is going to bend or break. Aluminum frames tend to work very well because the structures are built out of triangles, which is the strongest form you can create. My homeschooled son and I used to build big bridges out of lego and the only way to make it work is to build a lot of triangles and put them together. The only part of your bike frame that is not a triangle is the front fork, so it is particularly vulnerable to getting bent when rammed from the front. If you have to replace your front fork you’ll need to get a new crown race, about $2.50 from China on ebay. Getting the old crown race off is nigh-impossible. I still have not found a front suspension fork that works well in cold temperatures, so all my winter snow bikes still have rigid forks. I’ve been testing the Luna $89 Suspension fork all winter, which is a metal spring fork, but the grease quickly locked up from the cold and now it is essentially functioning as a very heavy fixed fork. 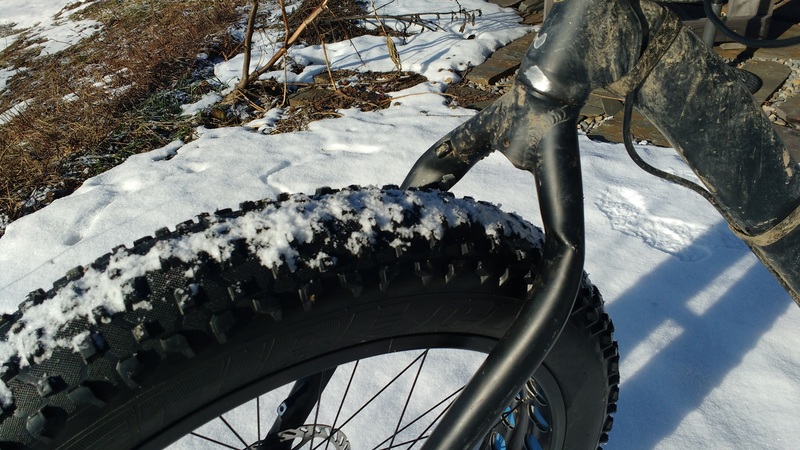 That fork is a 1 1/8″ diameter fork which is the most common headtube diameter for normal bikes, but it seems that fatbikes are all moving to the Tapered Headtube so that they can be compatible with the Bluto front fork (which has a lot of problems in the cold). In my opinion, the Bluto front fork is a little overpriced at $549 for a fork that does not work in the winter. 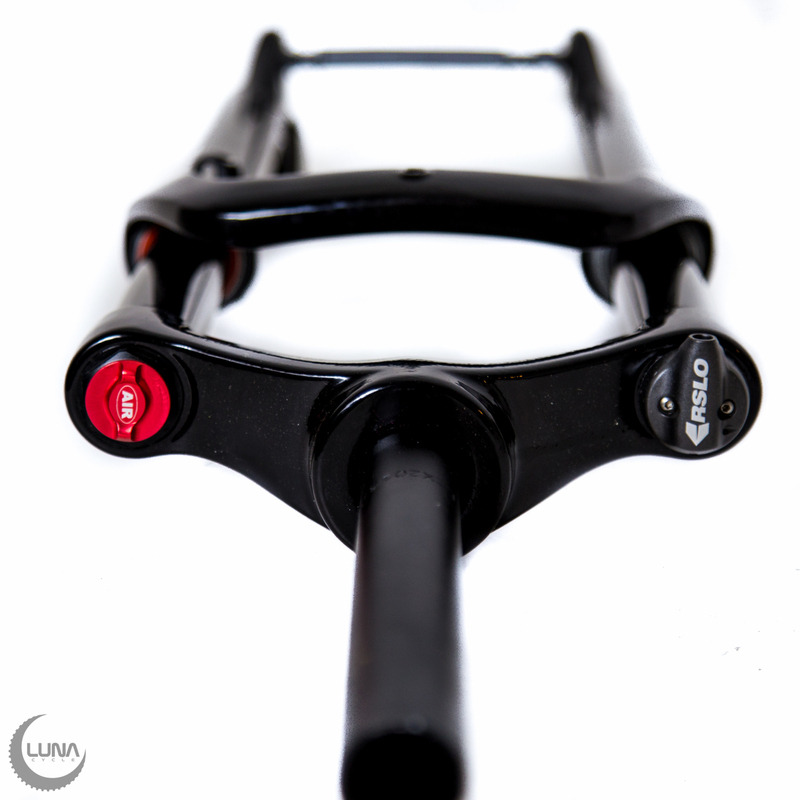 If you have a 1 1/8″ Headtube then you can try the Luna Lander which is a budget air fork for only $195 that will work with 5″ tires and might be decent in the snow (I have not tested yet). I’m saving my pennies for one and I’m sure that eventually, I’ll post a review for it. 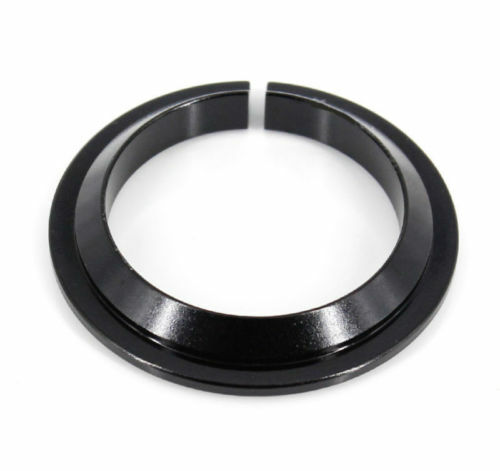 Be aware that the Luna Lander is for quick release not through hole axles. In closing, I would say that when you are shopping for a fatbike it makes more sense to lean towards CrMo/steel front forks and away from aluminum/alloy/6061 forks when you can. Suspension forks are a great option for fatbikes, but I have yet to find one that works properly in the extreme cold. If you know of one that does work, please post about it in the comments section below so I can squander my hardly-earned cash on it. Once again it is proven that steel be real. Grant Pedersen of Rivendell has made a career of it, and seems to have hundreds (maybe thousands?) of customers who feel the same. Glad you survived the collision in one piece, and neat trick swinging the fork around! That was a neat Macgyver trick, switching the forks around. Saved you a long walk back, that’s for sure. About suspension forks, have you ever tried changing the oil inside? A synthetic suspension oil won’t react to temperature changes like conventional oils do. I also want you to try a twist throttle again. I just switched to a right-side, full-twist, throttle, and while it took a while getting used to, it is valuable for one reason. Riding twisty single-track trails requires leaning to both sides to turn around the trees. I discovered that simply letting off the throttle a bit shifted my weight forward at the same time I would lean left or right to turn. On the trails I ride, I have a lot of 90 degree or greater corners. It is much easier to lean into a corner as part of a braking weight shift, then it is to push the bike left to lean right. I’ve lost it more often trying to turn into an off-camber corner without leaning, than for any other reason. My last ride felt really good, throttle-braking into the corners, and accelerating out of the corners. I did have one throttle-related wipe-out though, but I shut it down quick with the brakes. Save the old fork and use it for “wall art”. I would like to know the weight of the Ally fork to see how much the manufacturer “saved” in weight, over whatever fork you replace this with (Surly?). When I was shopping for a solid fat fork, I noticed Surly’s were going for $90 brand new on Craigslist, because a lot of guys were immediately upgrading to the Bluto right away. Try a lauf. Carbon brilliance. Why not replace it with a carbon fork? I installed a $95 Chinese carbon fork from eBay and it’s working out great, very plush ride for a rigid and very well made. You say suspension forks fail in the winter – maybe you need a lauf fork – developed by an icelandic company ? Yeah I would love to test that fork but I don’t have the money. If they sent me one I’d test it and send it back but since I destroy so much stuff, most of the time people are not eager to do that.